Advantix is one of the most trusted names in flea and tick protection, and for good reason! K9 Advantix II is an easy to use and effective product, beginning to work within 12 hours and lasting for 30 days. Rated 4.5 out of 5 by 615 reviewers. So far I have not seen any fleas so the product must be working. I have two dogs and I give then the dosage once a month. It is a very good roduct. Easy to use and has been very effective on my dogs. Great for dogs Not so good for humans!! Seems to be effective for fleas; hard to tell about mosquitoes. Checks off all of protection needed. This product is very effective. K-9 Advantix II is a lifesaver for my dogs! The only one to buy! Product has always been exactly as claimed. Good, solid product. Does what it claims to. Absolutely the best flea product on the market today ! Lasts longer than Frontline on my larger dog. still finding ticks on our dogs. In Two Words: It works!! 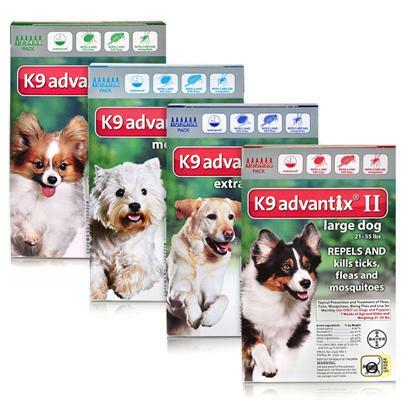 This is K9 Advantix II for Dogs is a high quality and effective product that is easy to use. Love it and so does my dog! This product was a perfect fit for my pup!